The slightly smaller lunch serve cost $1.44 per serve. It was our regular “beers” night with a friend, and we were once again at Gordon Birsch in Burbank. We may have moved from Burbank but we seem to be at Gordon Birsch with about the same frequency. The Gastro Pub burger is pretty good, and the fries were crisp, hot and fresh. $12.95 on the menu, but closer to $16.95 with tax and tip. Wild caught smoked salmon, cream cheese and capers on an onion bagel. What’s not to like? Lunch today cost $2.98 per serve. What to do with a pound of ground pork from our last meat delivery? 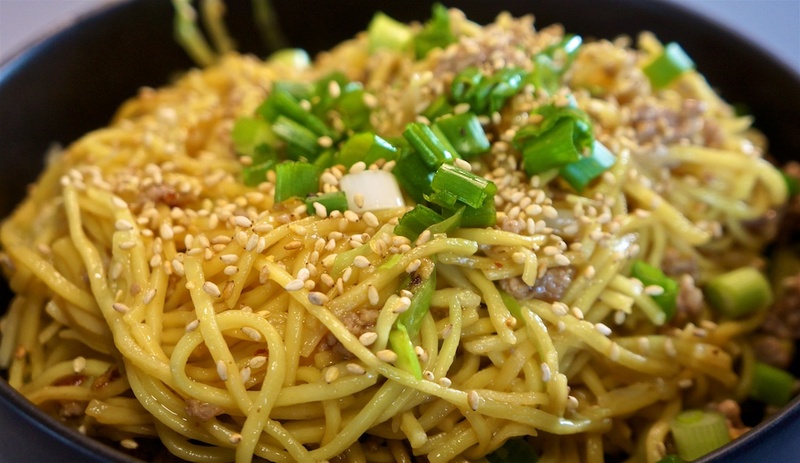 Stir Fried Shanghai Noodles with Ground Pork and Cabbage, that’s what. The recipe makes four very generous serves. The shredded green cabbage was $1.29 for the pack, or 33c per serve. Dinner tonight cost $3.79 per serve for a filling and very tasty dish. We decided to go out for lunch, for no particularly good reason. Our favorite is The Country Deli. They serve a 10 oz marinated skirt steak that is always good when cooked rare. Served with three eggs, home fries and a bread/bagel, it’s a huge meal. Foodie Greg’s corned beef sandwich was likewise excellent, although he was thankful he ordered a half! Lunch at the Country Deli runs out around $20 a serve with tax and tip. Tonight we revisited Bacon and Black Bean Chili. Again we doubled up on the beans. 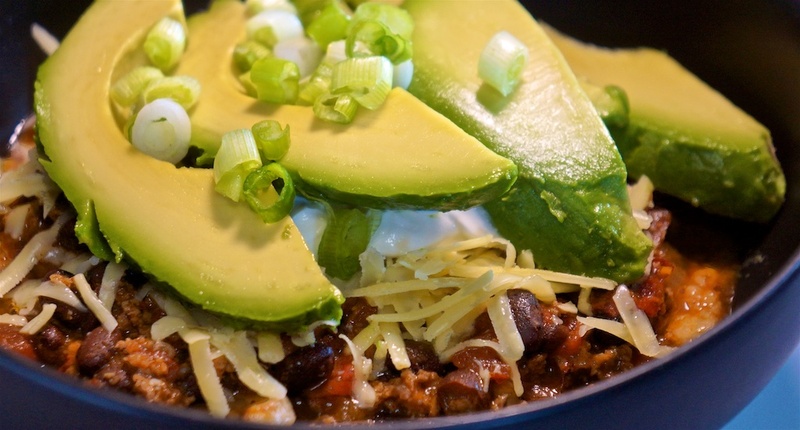 This is an amazingly good chili. The recipe officially makes four serves (and that’s what I used to calculate pricing) but we find it makes six serves with the extra beans, and the ‘fixins’: avocado, sour cream, and spring onion. All up dinner cost us $5.53 for a very filling serve. We used theTrader Joe’s Just Chicken’ again. As it was yesterday today’s lunch cost $2.32 per serve. Continuing our experiments with the new smoker, we smoked some already-cooked (but not smoked) pork sausages from our Prather Ranch delivery. The smoking definitely enhances the flavor, although the result was a little more subtle than the meat we’ve smoked from raw. Served with a double serve of the double ‘potato’ halloumi bake left over from last night. 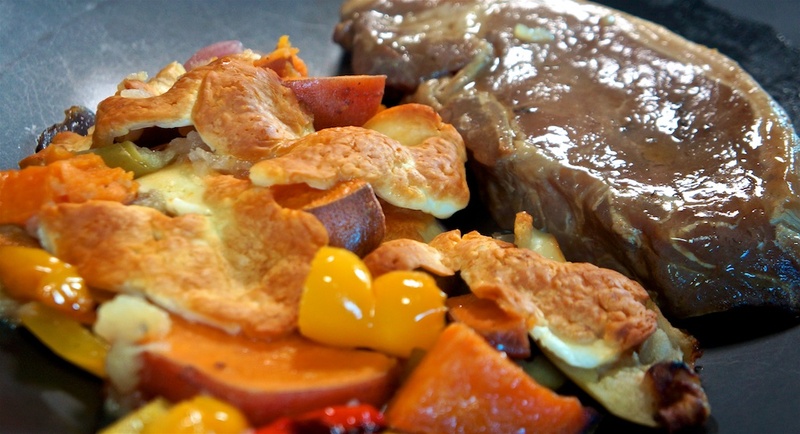 The sweet potato, bell pepper, apple and halloumi bake is $1.93 per serve, and we doubled up for $3.86 per serve. The sausages $12.46 for two packs, or $3.11 per serve for the best pork sausages we’ve ever had, even better with a little smoke. Dinner tonight coast $6.96 per serve. We used theTrader Joe’s Just Chicken’ again. Today’s salad was a repeat of the Kale and Broccoli pack we had a couple of days ago. The pack is $2.49 and for today’s lunch we used 1/4 or 32c per serve. Lunch today cost $2.32 per serve. Since we now have a smoker and there were thin-cut pork chops in our Prather Ranch delivery, the decision was obvious: smoke the pork chops! First a brine to ensure the result was tender and juicy. Serve with a modified version of Nigela Lawson’s Double Potato Haloumi Bake substituting Granny Smith apples for the potato, after all pork and apple is almost a cliche. It’s a great modification but we would put the apple in about half way through cooking, rather than for the full duration. The recipe makes six serves. Dinner tonight cost $1.93 for the side and $4.98 or the protein or $6.91 per serve. The smoked pork chop may not have looked as appealing as one fried off, but the taste and texture were amazingly good. 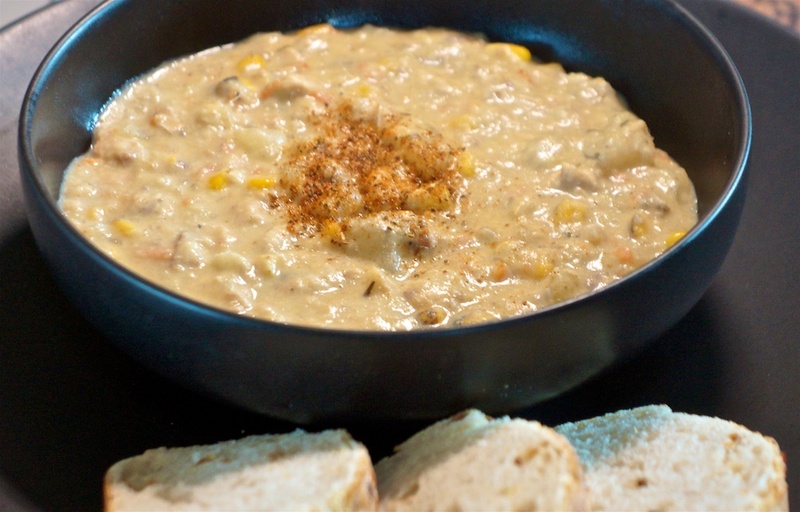 Left over Salmon Corn Chowder makes an excellent lunch. A slightly smaller lunch serve. Lunch today cost $1.44 a serve. A business meeting found us at Umami Burger where had a burger each and shared truffled fries. Everything we’ve had at any Umami Burger has been great. Truffled fries $1.94 per serve with tax and tip. Dinner tonight cost us $18.69 per serve. A cool ‘May gray’ day was perfect pie weather, and a Trader Joe’s Steak and Ale Pie hit the spot perfectly. The two pack is $6.49 or $3.25 per serve. A medium onion is around 20c or 3c per serve. The salmon chowder cost us $1.92 a serve. Served with Simple Truth Ready to bake garlic bread – $2.50 for the loaf (on special) or 60c per serve. The total for this quick and easy meal is $2.52 per serve. Burbank Monday was a little different this week, so we ended up having burgers from a little burger shack on Riverside Drive at Camarillo St.
Bacon cheeseburger with tomato, pickle and lettuce for $5.38 with tax. 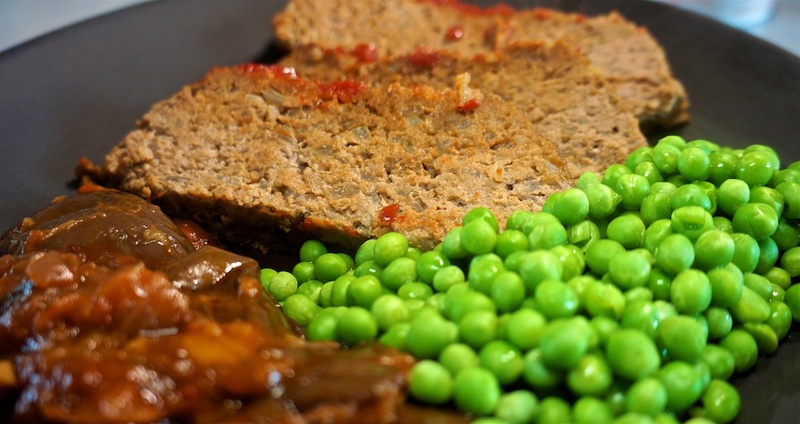 Time for the second half of the meatloaf, served with Trader Joe’s Grecian Style eggplant and frozen peas. We heated the peas and eggplant after frying off the meatloaf. Frozen peas are $2.79 per pack and we used about 1/3 or 47c per serve. Dinner tonight cost $4.89 per serve. Being a Sunday lunch we bought a baguette and had it with a variety of toppings: liverwurst; mayo, egg and pickled onion; and cheddar and sauerkraut pickle. The Australian/English style pickled onion – onions in a sweet vinegar pickle – cost $5.09 per jar and we used about half for lunch, or $1.28 per serve. Lunch today was $3.72. It’s clearly time to make our own pickled onions! 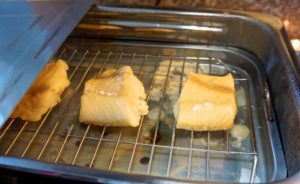 The semiSerious Foodies have a new stovetop smoker, and the first thing smoked was some cod, because it’s impossible to get smoked cod otherwise. You can see the smoke layer around the edge of the cod. 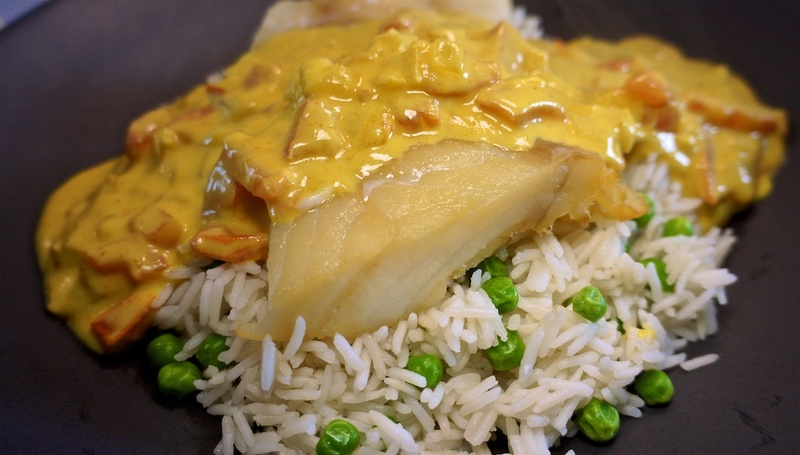 The cod would normally be cooked in the kedgeree along with the rice, but we did a somewhat deconstructed version. Other ingredients add another 32c per serve. Dinner tonight cost $4.69 per serve. The smoked cod was very good, with a more subtle smoke than commercially smoked fish. Now on to smoking pork chops! Lunch today cost $2.58 per serve. Two pounds of Prather Ranch dry-aged ground beef in the freezer was calling to us and a beef meatloaf answered. 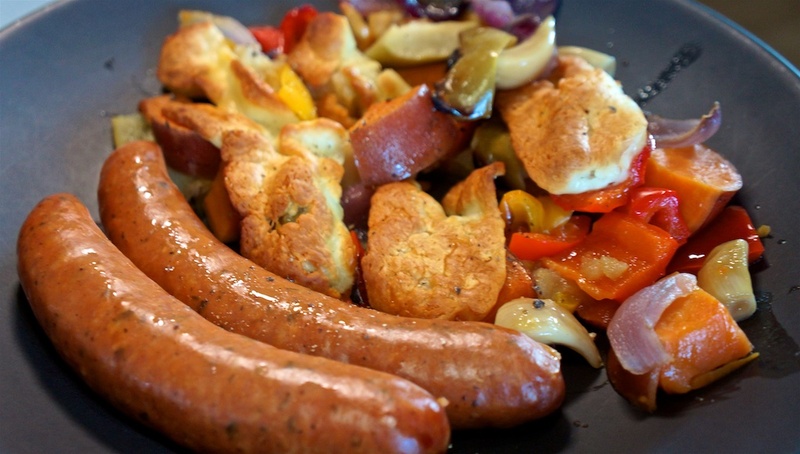 Paired with mashed cauliflower and brown gravy it makes a great diner-esque meal. We chose Barefoot Contessa’s classic recipe with 2 lb of beef. Because we get a direct-from-farmer meat delivery, the dry-aged ground beef was around $8 a pound. 2 lb of grass fed, dry-aged beef cost $8.00 per lb or $2.00 per serve. The prepared brown gravy is $2.00 per pack, or 67c per serve. 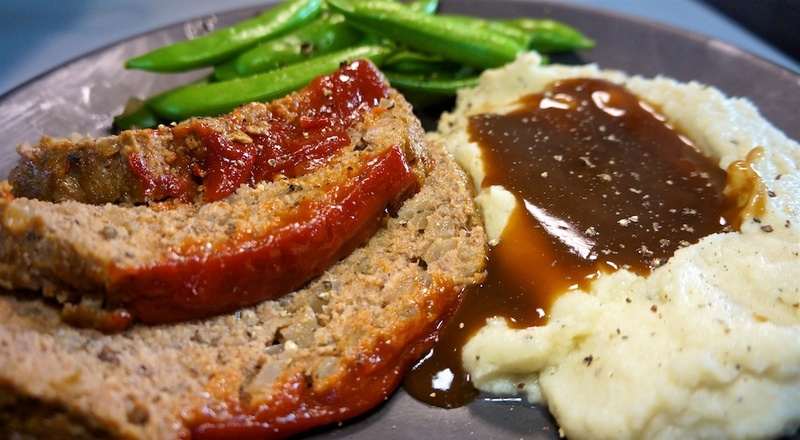 The meatloaf had great texture and flavor, and cost $5.27 per serve.